So....Time to make a call to Kimbrel? Are You Ready For Some Football?!? News flash: you're not betraying baseball if you watch some football. And you're not betraying Twins Daily is you check out Vikings Journal. There is room for both in your hearts. There is room for a lot in your heart. Turns out, you have a big heart. So check it out. And if you like to dive into the details on stuff, you might want to pay special attention to the Vikings Journal Forums, where all kinds of smart folks get together and talk Vikings. Maybe even you. Prediction: 12-4, beat Packers in NFC Championship game and SB victory. Wouldn't that be a wonderful way to end a season! With these yahoo announcers on Monday night, I just may take mondays off the rest of the year. Chris Berman sounds old. He's done as an announcer. Though I doubt Berman is as old as Anquan Bolden and Vernon Davis. Um, I thought the Vikings were playing tonight!!!!! Oh, that is the Vikings????? I thought they were suppose to be good this yr!!!!! Listening to Dilfer and Berman call a game makes me want to take a shotgun, load it up with ice picks, and blast it directly into my ear drums. Helen Keller is the only person in history who wouldnt have minded that broadcast. Good lord. Also the niners coach looks like Mike Tice's estranged cousin who had a windowless van that he lures children in with promises of candy and balloon animals. Who's aged worse, Berman? or... Peterson? Who's holding the real Bridgewater hostage? We were ready, the Vikings were not. I think Berman only does one broadcast a season, and lucky for us we had to endure that. Someone should tell him to lay off the smokes, and Trent Dilfer was yelling the whole game like he just attended a concert. Well, that had to be one of the most disappointing Viking performances in quite a while. So much hype and they looked like the worst team in the league. Just to echo a couple of earlier posts outside of the play...Berman and Dilfer are the absolute worst announcers - I hope I never have to listen to them broadcast again. 49ers uniforms are ridiculously ugly - and what do those colors have to do with their uniform. Bears had the same crap - Fire Goodell for allowing that alone - lol! Totally outplayed at the line of scrimmage - not looking at the game tape - but our Linebackers always seemed to be out of position and Hodges looked like the main culprit - Greenway looked slow - I would like to see more Kendricks. Peterson looked hesitant - not sure if that was the blocking or if he is rusty. Don't know what was up with Bridgewater - looked more like a Ponder out there. For the first time I can remember since the Giants-Vikings conference game - I turned off the game before it was over and had no desire to flip it back on. Good news is that this is one game - team has a chance to rebound - will be very interested to see how the team comes next week at home versus the Lions. I guess the bad news could be if we have to watch 15 more like this. 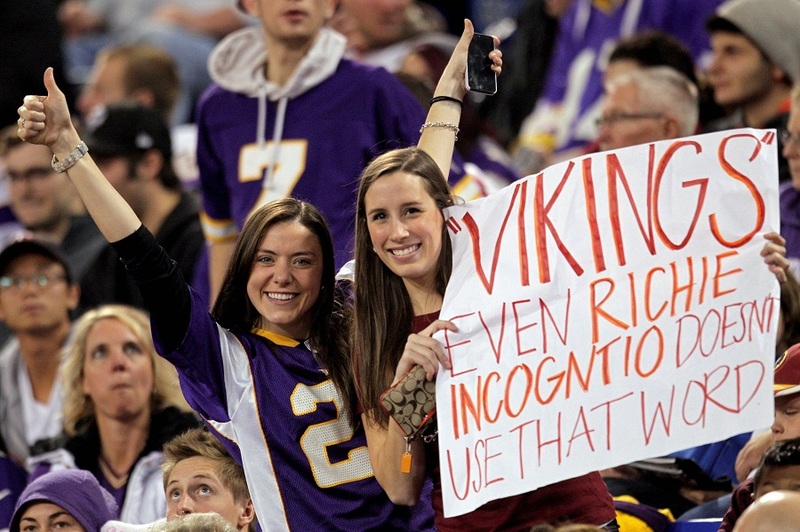 No worries, the 2015 Vikings are just following the 2015 Twins blueprint. Remember that opening week for the Twins? → Article: Are You Ready For Some Football?! ?